Trash: Does burning beat burying? Disposal of municipal solid waste is a necessity of modern life. Why does much of Europe rely on incinerators while landfilling is predominant in the United States? How do these choices affect air pollution, greenhouse gas production, and recycling levels? Article analyzes the inevitable tradeoffs of garbage disposal. 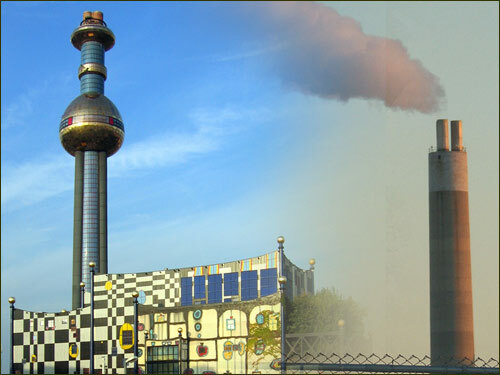 On left, an incinerator in Vienna. On right, Detroit’s incinerator, the largest in the world. Some people in the United States fear waste incineration will undercut recycling rates. But in Europe, many countries have high rates of both recycling and incineration. How is this possible? What measures are used in Europe to control air pollution from garbage incinerators? Contrast the European and U.S. approaches to garbage disposal. How do the comparative costs and benefits stack up? What do these different approaches say about the societies that use them? On a sheet of paper, make one column for landfills and another for incinerators. List the advantages of each approach on the half top of the sheet, and the disadvantages on the bottom. Students can circle those advantages and disadvantages that seem most compelling to them. The environmental impact of garbage and its disposal affects greenhouse gases, land preservation, use of fossil fuel, energy production and consumption, economic costs and recycling rates. Ask students to rate these factors from most to least important. Ask them to explain their choice with one short (but complete!) sentence. Garbology” lesson: Packaging your product.